Your library resources are available anytime, anywhere. If you are interested in taking free GED classes, please contact us via email: director@groesbecklibrary.org , or a phone call at (254)729-3667. If it is after hours, please leave a message and a call back number! Are You A City Of Groesbeck or Limestone County Resident? Do you want a Groesbeck Library Card to access thousands of books, materials, ebooks, and data bases? 4. Provide a current/valid Texas Driver's License & proof of matching Current Address. Example: "Mail-Utility Bill-Car Insurance"
6. If you already have a Library Card and need to update your information please call 254-729-3667 or stop by the Groesbeck Library where Library Staff can assist you. Copies are available at the Groesbeck Maffett Public Library for $21.95!!! 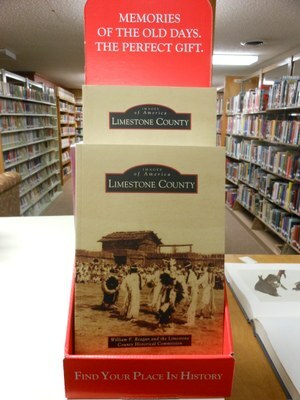 This pictorial book is a must have for anyone interested in Limestone County history! Come by the library today to pick up your copy! This is a factual narrative of the settlement and organization of one of the older counties in Central Texas. their dispersal by Indians, other Indian hostility, and attempted settlements. Shelf & Research - Work and research from the office or from home, anytime . Please see your librarian for a username.